It is not uncommon for a great spiritual personality to be born in poverty in remote villages out in the country and to emerge from it gradually into the wider scope of the world at large. In any case, whether such circumstances and nearness to nature deflects such minds to the investigation of life and its meaning, is of no ultimate significance, for a great personality is something more than just the circumstantial background from which he springs, and natural conditions may leave their impression the character or they may not, as the case may be. 0n Friday 10th of October 1885, in the village of Songpinong, Supanburi province, Sodh Mikaynoi, as he was named, was just another bundle of helpless humanity issuing into the world. Nevertheless, the intelligence and strength of character of this helpless bundle manifested itself even at an early age. One day when he was a year old, Sodh started to cry for some cakes, asking for his mother. The relative, in whose charge he was, tried to comfort him by saying that his mother had gone to work in the fields. At this he suddenly stopped crying. His mother (thought he) had to go to work in the fields. This meant only one thing. That he had been born in a family which was poor. From that day forth he never cried for cakes again. If Sodh had set his mind to achieve anything he would get down to it and not leave off until it had been accomplished. In his chore of helping his parents on the farm, it so happened that the baffaloes often strayed off to mingle with the buffaloes of the neighbouring folk. Little as he was, he would make off and not return until he had tracked them down, which often enough took him into the dark before he ended the quest, leading them back through the night. His compassion for animals was great. Another of his chores was to help his folk plough the fields each morn. As it neared eleven o’clock, he would gaze up into the sky to note what time it was. His sister often took him to task for this, accusing him of only waiting for the moment to take time off. However, the old folk knew that this was not in his mind, but rather the old proverb that eleven kills the buffaloes’, which was for him a grievous crime. He worked according to schedule, and no matter what anyone might say, stuck to his belief, of not working the animals after eleven. If he saw that they had been overworked and were terribly tired, he would lead them off for a bath before he let them loose to graze at freedom in the fields. In this fashion he helped the old folk until the age of nine. His uncle having become a bhikkhu, his mother sent him to study under him at the village temple of Wat Songpinong. In those days, when bhikkhus were the only teachers and there were no public schools, it was customary for a bhikkhu not to take residence in one place for long. Thus, after only a few months his uncle moved to another temple, and he followed. The bhikkhu next moved to a temple in Thonburi, across the river from Bangkok. As this was quite a distance from his native village, the young boy did not follow him, but was dispatched to study at Wat Bangpla in Nakorn Pathom instead. He was at that time eleven years of age. He remained there for two years, and increased his knowledge of Thai and Khmer. After which he returned to Songpinong. Then, when he turned fourteen, his father died. The responsibility of administering the family business of farming fell on his young shoulders. The family possessed two river boats manned by a few laborers, whose task was to float the rice-produce down to Bangkok two or three times a month. Young Sodh displayed efficiency in the handling of his charge, and was loved and respected by his employees as a person of strong character and great energy. Once, when the boat was anchored at Bangkok, an employee of his brother-in-law stole a thousand baht. He went to the police and together they pursued the thief by boat all night until dawn. Sodh spied the thief at one of the windows of his house and the officer was informed. However, before the boat could come to shore the thief had hid himself. Noticing that the man left traces with his wet footsteps, he told the police to wait in front while he himself tracked him down. He found the man hiding in the haystacks, who as soon as he saw Sodh coming dived into them. But the police having been informed, he was pulled out and handcuffed. They then retrieved the cash. sion of him, and as a consequence considered the possibility of making himself scarce. And how? By changing positions with one of his employees, and letting the man steer whilst he went forward. For it was the usual procedure for these bandits to attack the steersman first, it being taken for granted that the steersman was almost always the owner of the boat. If he went forward to the prow he had the opportunity to defend himself and make his escape. As soon as this idea took possession of him, he loaded his gun with eight bullets and went forward, ordering his employee to steer. During this exchange the boat was floating down into the most secluded part of the canal. It was only then that he began to be plagued with doubt about his project. After all, this man whom he engaged earned only twelve to thirteen baht, whereas he was not only the owner of the boat but the cash as well. Was it fitting, therefore, that he throws the risk of death upon him? It was indeed a bit too much! By that time, however, the boat had drifted on and was approaching the mouth of the canal, where many cargo vessels were anchored, preparatory to crossing down the canal as soon as the waters rose. The vessels were congested that each one could make little headway, and the merchantmen were shouting among themselves. The danger of being attacked, therefore, had passed. The responsibility of supporting his family, however, rested on his young shoulders. It was not until three years later, when he was twenty-two, therefore, that he had the opportunity of entering monastery. He returned to his cell, thinking the bhikkhus in this temple are stupid indeed. They can memorize and recite but know not what it is all about. What then is the use of memorizing anything? This is the door to stupidity, not knowing how much there is. The first day of his stay there he received nothing at all. The second day it was the same. Wherewith the thought perplexed him whether one who keep the 227 rules of morality is to perish for lack of something substantial to eat. If so, then perish he would. Because if he failed to receive any rice at all he refused to eat. Better to starve, for if he died all the bhikkhus in the city would have enough to eat. And why? Because the layfolk hearing of the news that a bhikkhu had perished of starvation, would soon feel heartily ashamed of themselves, and out of compassion feed them all. Somewhat dismayed at this, he thought of retrieving the banana, but recalled that a bhikkhu does not take back something which he had already given away; it was not fitting therefore to do so. Unless, of course, someone was to re-offer it, with both hands, as is the rule. But at that time and place no such personage presented himself to oblige. From that day forth, however, he receive sufficient food. Enough even to share with his fellow bhikkhus. Besides this, some layfolk offered to provide him with a tiffin-set of food every day from that day forth. Nevertheless, as a result of this lesson, Candassaro vowed that as soon as it was in his means to do so, he would establish a kitchen whereby food could be distributed to the monks and novices, without encountering such stringency, saying them all a waste of time going the round for alms when they could devote themselves to study instead. This was fulfilled much later, after he became Abbot of Wat Paknam, where he established a kitchen and refectory at a cost of 360,000 baht, feeding monks, novices, upasakas, and upasikas of about 900 strong. The upasikas were detailed to run the kitchen. In the beginning, rice had to be shipped from the family farm in Songpinong. Later, however, help came from layfolk and continues down to this day. Once, the rice supply in the store had reached its dregs, and there seemed no prospect of a fresh supply for the meal next day. The bhikkhu-in-charge of the store was at his wits end, and went to inform the Abbot. He was told not to worry and to be calm, there would be rice. The bhikkhu, however, had his doubts and returned to his cell to brood on the problem. But this was years later. At Wat Bodhi he continued his studies, and did translations of the scriptures. But he did not finish his course. He failed in his examination, and did not continue. He later recalled, that if he had passed it and attained to a high degree of scholarship, the Sangha authorities would have recruited him to work along those lines, to the loss of Vipassana. 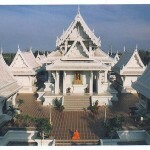 As it was, whenever he could find time off from the Pali courses, he was practicing Vipassana at this centre or that. Considering that it was about time that he become a wandering bhikkhu, he requested his aunt for a forest umbrella under which to sleep, and refused to take one from any one else, wishing her to receive the merit arising from the gift, due to her past services rendered him. By now he had been in the monkshood for eleven years. He had stopped his Pali course because he had already attained proficiency in the translation of the scriptures, and was satisfied. As for Pali, there was no end to the translation of it. It was enough that he could read and understand. He had fulfilled his wish which he made in the beginning of his studies at Songpinong temple, to be able to translate the Mahasatipatthana Sutta, which he had been unable to do. Now that he had achieved his aim, it was best to devote all his time to Vipassana. It was thus that on the full moon day of September of that year, he retired to the Uposatha with the purpose of meditation. It was already evening and there was no one around. Before commencing, however, he invoked for aid and light. If not complete insight, at least a little portion of the truth which Buddha had beheld, had known. However, if adversity for the Sasana should result from this, then let this opportunity pass from him. But if it should be beneficial, then let this boon be his, for he would be a witness to it for the rest of his days. At that moment, however, he recalled the ants which were crawling back and forth in the crevices of the stone slabs. Picking up a kerosene bottle, therefore, he wet his finger with it to draw a circle round him and thus prevent the ants from disturbing his meditation. As his finger touched the slabs, he recalled that only a moment ago he had made certain vows and here he was already thinking of the ants. The thought of which made him ashamed, wherewith the bottle was put away. Once having settled himself down to meditate, he forgot the time, and many hours must have passed, although there was no clock to tell. But although all was still and dark in this lonely place the hours had not passed in vain. 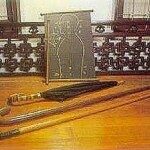 For it was during this session that he perceived the truth, the reality, the path his Master before him had trodden. Nevertheless, this realization was not without disturbing thoughts. For the dhamma was indeed profound. If one wished to penetrate it, one had to sink all perception, memory, thought, and knowledge right down into the diaphragm and stop at just this point. But as soon as stopped, it died. As soon as died, again arose. That was the truth. The truth was centred right at this point. If concentration did not sink exactly to centre here, right into the void of the sphere which appeared, then for certain nothing could be seen, nothing at all. After the season of rains, in his thirteenth year as a bhikkhu, he proceeded to Wat Pratusarn, the Abbot of which had ordained him. But his old master was dead. He stayed there for four months and during that time many were the layfolk who came, requesting him to discourse on the dhamma. He did so once, to the great satisfaction of all. Again he was invited to deliver a sermon. But he knew that if he did so the present Abbot would be displeased. So before delivering it, he packed his things ready for departure, delivered the sermon, and then went to the Abbot to take his farewell. He then departed immediately, to avoid unwholesome repercussions, making his excuses that he had already arranged to take some bhikkhus to the capital. Wat Paknam, of which the Chao Khun later became Abbot, was erected during the period when Ayudhya was capital of Thailand, some five centuries earlier. Forty years ago, when the Chao Khun first arrived there, it was deteriorating in neglect. Discipline among the resident monks and novices was lax, after the decease of its Abbot, and also because of lack of student facilities. Due to this state of things, the Chao Khun was detailed to go there and take over. Thinking at first that he would reside there for only three months and then return, he, however, was ordered to hold fast and warned that unless the earth quaked he had better not return. Which was tantamount to a sentence. The ruffians seeing that things were not so good, bashed off into the dark. These obstacles did not dismay the Abbot, because he considered them to be occasions for the augmenting of merit and parami. Despite the obstacles the teaching spread. And as he divided his time to administering to the affairs of the temple, he continued to delve deeper into Vipassana. When he first came to Wat Paknam, there were only 13 bhikkhus and novices, together with a few nuns. Keen, however, that all should do something, whether it be the study of Pali or Vipassana, the temple was soon established as a seat of learning. Until in 1939 a three storied edifice, 60 metres long and 11 metres in width, costing about 2.5 million baht, was built up as a Pali Institute. Which up to this day about a thousand bhikkhus and samaneras frequent, not only the resident monks and novices but from other temples. In 1955 the Chao Khun was bestowed the title and ecclesiastical rank of Phra Mongkol Rajmuni, which was later followed by Chao Khun Phra Mongkol Thepmuni. As the teaching spread, bhikkhus and nuns carried the message out into the provinces. Among the hundred thousands who at sometime or other practiced the method, a few thousands attained the Dhammakaya’s degree of insight. One day as I was seated talking to an old lady, a neighbor of mine, who had also retreated to the suburbs to evade the bombs, a man came along and started talking about how he had once learnt Vipassana from a nun. I pressed for more information on this point, expressing the view that Vipassana was the practice of meditating on dead corpses. The old lady cut in at once, saying that was not Vipassana but only meditation on impermanence. I therefore asked her what Vipassana was. And was told that it was the investigation and perception of the realms of heaven and hell and Nibbana. “I was confounded. The man who was present was also amazed. Never in my days of learning the written dhamma had I heard it expressed like this before, in such a casual tone. It is true that in the scriptures there was mention of Moggallana Thera and others visiting such places, but there was no mention of that being Vipassana. As for Nibbana, it was beyond thought or speech, as far as I was concerned. Nevertheless, the old lady persisted in her view, saying that she would give me a book to read, concerning the teaching of the Abbot of Wat Paknam. “One day I availed myself of the opportunity and visited Wat Paknam. The Abbot was at the eleven o’clock meal, and there were many seated around awaiting his good pleasure. I went forward to make my obeisances, expressing also my desire to learn. He bid me wait awhile and went on with his meal in silence. “Eventually, opportunity was offered me to come closer and converse. He began to discourse on the virtues of the Buddha explaining as he went each virtue. As I listened I was impressed by the profundity of his exegesis, expressed in a manner which I had never heard before. “With the memory of this discourse ringing in my ears, I in the days which followed pursued my intention, of getting to know his teaching more in detail. 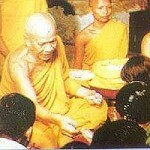 He discoursed on the dhamma on every full moon and quarter days, as well as Sunday. His discourses leant heavily in the direction of concentration practice. Listening in the temple on these days I realized that if the teaching was not recorded it would soon be forgotten, which would be a waste, not to mention tiring him out by constant repetition, I therefore came up with the suggestion that these oral addresses should be recorded. He agreed to my suggestion, and I started to jot down the teaching. “As far as I know, bhikkhus who practice meditation seldom possess the happy gift of expression. Those who preached well were more often than not scholars of the written word. However, I learnt later that the Abbot was himself once a Pali scholar, and it was due to this early training that he was able to express all dhammas in the light of his broad background. He would announce his subject in Pali and deliver the sermons in relation to concentration practice, interlarding the discourse with a supporting amount of Pali terms. In this way he never expounded at random but always substantiated his meaning from the Pali text. 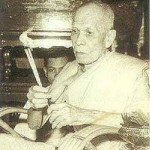 He relied with special emphasis on the Maha Satipatthana Sutta for this. Leading the bhikkhus and samaneras twice a day, morning and evening, in paying homage to the Triple Gem in the Uposatha, and ending with a sermon. Meditation practices both night and day with the bhikkhus, the nuns in a separate section. Every Thursday at 2 o’clock in the afternoon a meditation class open to the public. Supervising Pali Institute where qualified teachers taught the scripture. “Unless absolutely necessary, the Abbot never moved outside the precincts of the Wat, his efforts and time being devoted exclusively to the teaching of meditation. If laymen invited him out to partake of meals at their homes he would evade the invitation by inquiring if another bhikkhu could go in his stead. Nevertheless, he received guests at certain regular hours. Once after the eleven o’clock meal, and again at 5 o’clock in the afternoon. Other than that these times he was usually to be found supervising classes of meditation among the bhikkhus. 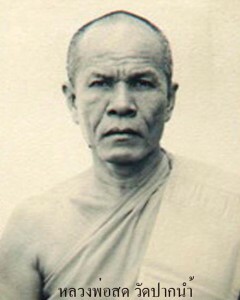 “Luang Por (which means father, and was the name by which he was referred to by his disciples) stressed meditation and his teaching leant heavily in the direction of ultimate truth. I have heard him discourse week after week on the various modes of conditionality (paccayas) as found in the Abhidhamma. “Gathering from rumors and the newspapers that a foreigner was soon to be ordained at Wat Paknam on Visakha day, I hastened to pay my yearly visits there and to be present at the ordination rites. Accompanied by a friend, I went to pay my respects to Luang Por on Visakha’s eve. “That night as I lay sleepless in the meditation room, his words continued to echo in my ears. That these foreigners came from far off places to seek that which is good and true. We are Buddhists, so close to the Sasana, and should not we be interested enough to go in search, as they, of that which is good and true? “My thoughts were in bad shape, and as I reflected on my life up to now I knew not on what to stand. What had I, which could serve me as a stay, steadfast and true? Nothing at all. Each day muddled up in work and a household life, always on the go to build up prospects for the future, just each day ahead. It was all right so long as I could use it all. Other than that there was nothing that this worldly life could do for me. If I went on at this rate there would be no end to all the heartache. There would be no escape from the daily round, and leading such a life without meaning I would simply grow old in vain. Thinking in this somber strain I remembered the saying that those who know the taste of the dhamma even for one day are better than those who know it not, even though they live up to a hundred years. At this turning point in my life this saying seemed only too true. I was going on fifty-nine, and if I didn’t take the opportunity now, then when? I would surely grow old and die in vain. It was a sleepless night for me. Neither had I a friend in whom to confide to ease my distress, or from whom to receive advice. I had no one but myself. I was my own true friend. But how could I warm or console myself? I brooded over the thought of giving up the household life, full of vexation and pain as it was, without a break. How long was I going to wait? Even a foreigner wished to be ordained. I was much closer to the Sasana, almost like an owner, and could I remain indifferent and fail to receive some solace from it after all. At dawn the next day, Visakha day, I went to Luang Por and expressed my desire, saying: I have been learning this dhamma with you for five to six years now, but still I haven’t attained the Dhammakaya teaching. Now I think I possess sufficient faith and courage to be ordained, so that I may have the opportunity to practice in real earnest once and for all. Here follows the account of a bhikkhu who considers his ordination to be a special one, of honor, unique in this respect. “You would not think that by looking at his broad face and nose, but failing to notice a wrinkle here or there, that this man was going on for seventy. His penetrating eyes and bearing showed him at once to be one accustomed to command, and one did not fail to gain the impression that although his living was plain, his plane of consciousness was not. “He paused, and gazed at me with his penetrating eyes, as though to read whether I was in earnest enough to take in all that he said. He continued to expatiate on the qualities of wisdom, purity and compassion of the Buddha, impressing me with emphasis of depth. “He continued to dissect on the merit of meeting and entering the Buddha Sasana at all, becoming its heir. I had to shift myself a little to ease my foot, for it was rather numb and I was tired, not having been accustomed to such positions before for so long. But was determined to fulfill my part of the bargain, and bore up. Luang Por seemed to understand my distress and gazed at me with compassion, as he continued. “He then went off to discourse about the four elements and the 32 constituent parts of the body, which the novice had to scrutinize and regard as unwholesome. He reduced the formula to only five, giving the Pali words, kesa (hair), loma etc., and telling me to repeat them after him by direct order and reverse. “Do you recall the hair which was shaved off your head before you came here requesting ordination? Did you not take up little in your hand and scrutinize it? “All right, then close your eyes and place the image of that hair in the centre of your body two finger-breadths above your navel. Sink it down right in the centre there, in the cross-section as of a string strung from right to Ieft and front to back, at the point of intersection there. Do as you are told. “Sink all your thoughts and memory down into the centre there, and observe carefully. “But all was dark as far as I was concerned. After all, what did he expect me to see with my eyes closed? Waiting to see what was next, I became more dubious with each minute. I was tired already, and if his intention was to try me out then the test had failed, for I saw nothing at all. Nevertheless, he persisted. “To his question whether I saw anything, I hastily replied in the negative. “Stop your thoughts, keep them still. Think of your hair, let it arise; see it, right there in the centre. Try and think of it alone. Do so and you will see’. “I did as I was told. I do not know exactly for how long I struggled with the thoughts which troubled me. And as I struggled for control, I consoled myself with the thought that all this must have some meaning after all, otherwise he would not be wasting all our time. “Strange indeed, but after a time I did begin to see something. Slowly it arose in the dark of me, a mere blur. Gradually, however, it grew clearer. It became so clear in the end that it was as though I was gazing at it with my eyes open wide. But my eyes were shut. What was it that I saw? The hair which had been shaved off my head. At this I began to grow rather excited, unable to suppress myself. “I see, I see!”, said I in a trembling voice. “To his question what it was that I saw, and whether it was hair, I replied at once in the affirmative. At the same time I felt relieved, thinking that all was settled and now I could go out and robe myself. But no, it was not to end as fast as I thought. Look carefully. That hair which see, in what direction are the ends of it pointing? Which way is the shaven portion pointing? In what manner is the middle portion curved? I sharpened my sight so as to be able to answer him. And as soon as I saw clearly, I replied. This, thought I, is the end of the matter. But again I was wrong he was commanding me to look on. I obeyed, though not without perplexity. After all, hair was hair, and I had already seen it. What then? “As I sat there for I know not how long, I gradually began to experience strange sensations of bliss. My body was growing lighter and lighter in a peculiar way. Despite the buoyancy of my body, however, the heart of me seemed completely at ease. So at ease, in fact, that I find it difficult to express. The hair which in the beginning I had seen, gradually eased away from my vision, until it vanished and in its place a circle of light gradually appeared, and I felt more at ease than ever. “At first I saw only a circle of light. Gradually, however, it seemed to condense itself. Then it began to expand. “It was like this for some time, with the circle as large as a gold coin. Radiance, spread out from this circle, and as I gazed on my attention was drawn towards centre. Then I observed that it was really like a clear crystal sphere, in appearance as large as the moon when it floats up in an empty sky. Apprehensive that this vision would disappear, I fixed my gaze thereon. I had lost my sense of weariness in the Iegs, and could not exactly say when and how it had left me. “Do you see anything else? 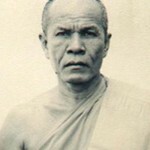 “, the soft voice of Luang Por came to my ears. “I see light, a sphere the size of a lime”, returned I. “All right. That is enough for today. Remember this sphere. Whenever you close your eyes you will see it, whenever your eyes are open you will see it. At no matter what time of the day you will see it. You will always see it. In fact, be careful, and never lose it. That clear sphere is the beginning. It is the path of the Blessed One whereby he attained Nibbana. It is the only path, the straight path; there is no other path. Remember this. Never let it perish from your sight. With this, he gradually extracted the yellow scarf from the folded package of robes and placed it round my neck, as I bent down to receive it.